Pressed Steel Tool Joint Protectors are designed to cover the entire thread form and seal area on both internal and external threads. They feature CNC machined thread forms for exacting fit. 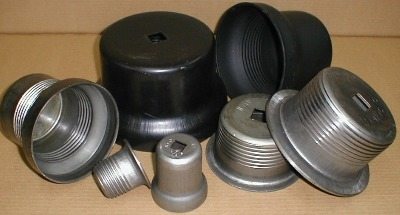 Thread form and size permanently stamped on part . Ease of installation and removal. Engraved - permanent ID for thread type/part number, no stick labels. Available in both API and Premium. Meets or exceeds all major oil company and premium thread to manufacturers' specifications. Drill Pipe : 2-3/8” through 8 5/8’s Premium Thread Protectors available on request. Premium Connection Type and Sizes : Available / Made on Customer Request. Oil Filed Supplies © Copyright 2009. Powered By : Yoko9 .